Pocket Towns (copyrighted) are a concept I ran across in an article in the January 2009 issue of Professional Builder Magazine. (Read Article Here.) They are high density housing on smaller lots (less than 3000 sf). The homes are pushed to the front and have as little as 5′ side setbacks. Living space varies from 950 sf to 2400 sf with a mix of one and two story homes. Read more about them on BSB’s website here. Becky and I were in Tampa a couple of weeks ago. Becky had a conference and I tagged along. 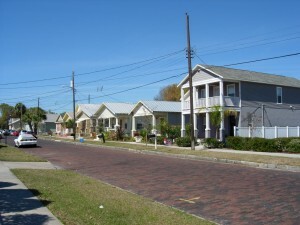 I didn’t see the new pocket town neighborhood discussed in the article, but I saw some of the old Tampa neighborhoods that it was modeled after. Somewhat narrow brick streets with granite curbs. (I’m still trying to figure out how granite curbs were affordable in central Florida at the turn of the century when there wouldn’t be a quarry within hundreds, if not a thousand miles.) At the end of the block was a library and a service station. Across that intersection were small shops and a neighborhood grocery store. These homes were built on an alley system with no garages or off street parking on the front. Parking was allowed on one or both sides of the street, but the streets were pretty narrow when there were cars parked on both sides. Having an alley also allows for utilities to be moved to the back side of the property. Optimally they would all be buried, but that is usually cost prohibitive and rarely seen in older neighborhoods. Some of the homes had parking in the rear or even a garage accessed from the alley. Part of the Green initiative is a move towards smaller homes and more efficient use of the landscape. The USGBC gives points toward LEED certification for efficient use of land. Notice the return of the front porch which I discussed here previously. The streets themselves were interesting too. 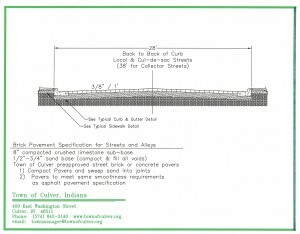 In our area, the recommended construction for brick streets have the streets crowned towards a concrete curb and gutter. 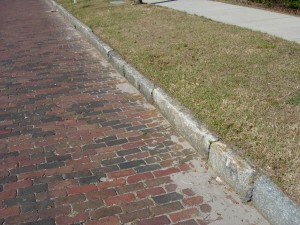 This allows storm water to run on the concrete gutter in lieu of across the brick where the brick surface would be eroded and the sand between the brick would be washed away. Florida is so flat and sandy that very little of the water runs off anyway, so the gutter line isn’t as important. The brick streets act as a solid driving surface yet a somewhat pervious surface to absorb storm runoff.